The gallery is open every day from 9am to 9pm. 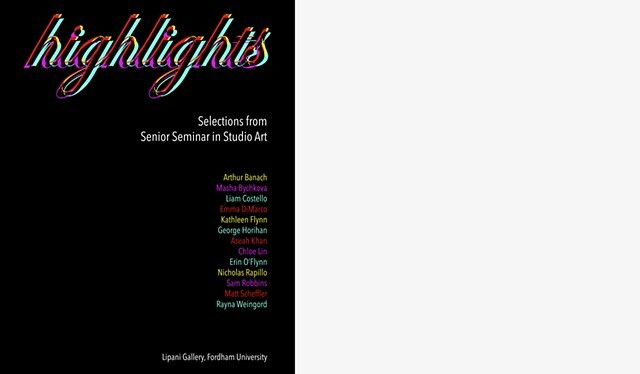 Highlights: Selections from Senior Seminar in Studio Art features work by students in Fordham’s Senior Seminar, a selective course for studio-art majors pursuing theses in architecture, film and video, graphic design, painting and drawing, and photography. Painter Arthur Banach plumbs hip-hop culture to create vibrant portraits that imagine meetings between well-known rappers and other African-American icons. Masha Bychkova uses installation and film to articulate a destabilized psychological space, attempting to answer the question: What do you do when nothing makes sense? Liam Costello offers plans to convert an abandoned railway track in Queens into a green space and Walt Disney–inspired “people mover.” Emma DiMarco photographs “flyover country” with a pastel palette and a sometimes dark humor, revealing the oddities of American culture. Acknowledging the paradox of her position as resident yet outsider, Kathleen Flynn documents her Bronx neighborhood from an oblique angle in photographs that embody both distance and intimacy. George Horihan symbolizes the meaning of compassion in abstracted drawings that recall the structure of woven textiles and scar tissue. Tapping her experience growing up in the ethnically diverse borderland between Queens and Brooklyn, Aseah Khan observes how various cultures shape our society in exquisitely detailed black-and-white photographs. Chloe Lin channels the nineteenth-century fláneur to produce vividly colored street photographs that capture moments of peculiarity, synchronicity, and randomness in the world. Erin O’Flynn complicates the binarism between man and nature in black-and-white photographs of national parks and monuments. Nicholas Rapillo proposes a design for an ecologically sustaining low-rise building complex in Harlem that offers points of contact between its inhabitants and neighborhood residents through vertical farming and technologies in energy production and conservation. Skipping across a range of abstract and figurative stylistic approaches, Sam Robbins establishes a self-referential visual syntax to paint diaristic works that withhold as much as they reveal. Matt Scheffler deconstructs the discipline of photography itself with pieces that call attention to the medium’s materiality rather than to its ability to depict. And Rayna Weingord explores concepts recognized in the field of psychology as elicitors of disgust with sterile-white abstract sculptures that both repulse and attract. Reflecting a broad range of interests, genres, stylistic approaches, and conceptual frameworks, this exhibition offers a preview of the solo and two-person shows that will be on view in the spring in the Ildiko Butler and Lipani Galleries.